Today your website must be as inviting on a mobile device, phone, or tablet, as it is on laptop or full screen desktop computer. As of February 2016 56% of all internet traffic is coming from a mobile device, and depending on your industry it could be higher. So it is pivotal that your site is easily navigable on a small screen. 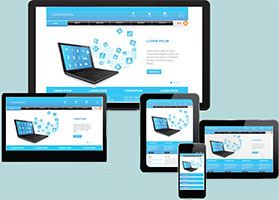 Responsive web design makes your web site look amazing on all devices - phones, tablets, laptops and desktop computers. Our responsive planning phase will begin by starting small and designing a framework for mobile devices, and then graduating eventually all the way to the desktop environment. When designing the site pages we make sure all the information that make up a page will be laid out in a highly optimal order to achieve the pages ultimate message. The smaller devices will be designed first and in a more liner fashion, or like blocks stacked on top of each other. As the screen sizes increase so will the size of the fonts and images that will fill the page in a graceful way. We will never leave out any content but rather adapt it so it will fit any device perfectly. Responsive Web Design is understanding how to hide, shrink, increase, or move your content to make it look awesome on any size screen. Being Responsival is the responsability you have to make sure your site will be responsive(fit) on all devices. By doing this you will insure that your business can be reached by anybody anytime anywhere in the world.